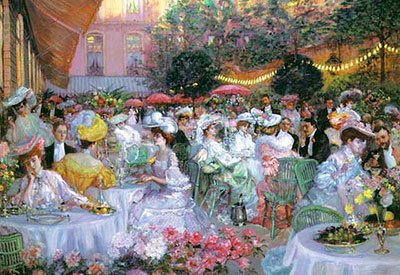 The picture shows the garden terrace of the Ritz Hotel in Paris, which openend its doors in 1898. This is one of the legendary hotels that were run by César Ritz (1850-1918) and Auguste Escoffier (1846-1935). I have spend many hours searching for a nineteenth-century painting with black salsify, but alas, it seems that never ever has a painter been inspired by this vegetable … But at least you can see the ambiance in which Escoffier’s black salsify fritters could have been eaten. 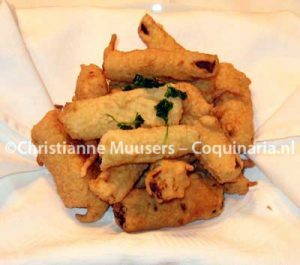 The recipe for fritters comes from the Guide culinaire, published by Escoffier in 1902. The cookbooks contains four recipes for salsify and black salsify (according to him, they are interchangeable): à la crème (with cream sauce), au gratin (like the first, but put under the grill with cheese and breadcrumbs), frits (marinated and deep-fried in batter), and sautés (fried). Here you’ll find the basic preparation for salsify (cooking in a blanc), and the recipe for fritters. Typically Escoffier: in the cookbook you have to look at several preparations to collect the entire recipe. The French text is from the reprint from 1993 of the fourth edition of the Guide Culinaire (1921). A glance at my Dutch translation from the first edition from 1902 showed me that at least the redaction of the recipes for salsify remained the same. Escoffier uses a lot of words, you cal also choose to move on directly to the adapted version. Les salsifis employès en cuisine sont de deux sortes: le salsifis blanc et le salsifis noir, qui est aussi désigné sous le nom de Scorsonère. Les mêmes préparations conviennent aux deux espèces. Quelle que soit cette préparation, les salsifis doivent être d’abord ratissés avec soin, lavés, puis cuits dans un Blanc léger. There are two kinds of salsify used in the kitchen: white salsify and black salsify, which is also called Scorzonera. The same preparations are used for the two kinds. Whatever preparation it is, the salsify must first be carefully peeled, washed, and then cooked in a light Blanc. Cette préparation n’a par elle-même aucune valeur culinaire, elle n’est qu’un facteur de cuisson et a uniquement pour but de conserver blanches les substances qui sont plongées dedans. Pour quelque substance que ce soit, le Blanc doit être porté à l’ébullition avant de la recevoir, puis recouvert d’une couche de graisse qui forme isolant, et s’oppose à ce que les substances en cuisson reçoivent le contact de l’air qui les ferait noircir. Préparation: Delayer à l’eau froide une forte cuillerée de farine par litre d’eau; saler à raison de 6 grammes; aciduler de 2 cuillerées de vinaigre par litre et faire prendre l’ébullition. Ajouter un oignon piqué d’un clou de girofle, bouquet garni, l’élément à cuire et la graisse destinée à former l’isolant; laquelle peut être de la graisse de rognon de boeuf ou de veau, crue, hachée finement et, au besoin, préalablement dégorgée à l’eau froide. Nota — Lorsque le Blanc est destiné à une cuisson de légumes, le vinaigre est remplacé avantageusement par du jus de citron. This preparation does not in itself have any culinary value, it is nothing more than a way of cooking and its only purpose is keeping the substances that are plunged in it white. Whatever substance that is, the Blanc must be brought to the boil before it is added, then covered by a layer of fat that isolates, to prevent that the boiling ingredients come into contact with the air, which discolours them. Preparation: add a heaped spoon of flour per litre water to cold water. Salt it with 6 gram. Acidulate with 2 spoons vinegar per litre and bring to the boil. Add an onion, with a clove stuck into it, a bouquet garni, the ingredient that must be cooked, and the fat that will form the isolating layer; that can be suet of beef or calf, raw, chopped finely and, if necessary, first rinsed in cold water. Note — If the Blanc is destined to cook vegetables, the vinegar is best replaced by lemon juice. Après les avoir bien égouttés, les tailler en tronçons de 7 à 8 centimètres de long et les mettre dans un plat. 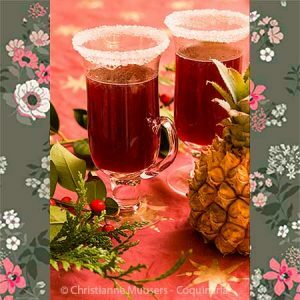 Assaissonner de sel et de poivre; ajouter: jus de citron, quelques gouttes d’huile et persil haché; laisser mariner pendant 25 à 30 minutes, en ayant soin de les sauter de temps en temps. Ensuite, bien les égoutter; les tremper dans une pâte à frire légère les mettre dans la friture très chaude et les égoutter quand la pâte est bien sèche. — Dresser sur une serviette avec persil frit. Nota. — La marinade préalable des salsifis est facultative, mais très recommandable. Cut them, after draining well, in pieces of 7 to 8 centimetres, and put them on a dish. Sprinkle with salt and pepper. Add: lemon juice, a few drops of olive oil and chopped parsley. Marinate for 25 to 30 minutes, while stirring from time to time. Then, drain well. Dip them in a light batter, fry them in very hot deep frying fat and let drain when the batter is dry. — Serve on a napkin with deepfried parsley. Note — The prior marinade is optional, but very recommendable. Délayer dans une terrine: 125 grammes de farine; une pincée de sel; 2 cuillerées de beurre fondu; un oeuf, et la quantité d’eau froide nécessaire pour obtenir une pâte claire. Autant que possible, l’apprêter une heure à l’avance. Vermeng in een kom: 125 gram bloem, een mespuntje zout, 2 lepels gesmolten boter, een ei, en zoveel koud water als nodig is om een licht/luchtig belag te krijgen. Voor zover mogelijk, een uur van te voren bereiden. Whatever recipe you want to prepare, the black salsify has to be cleaned and cooked. Escoffier uses a blanc for cooking the vegetable. This blanc keeps the salsify white. Other cookbooks from the eighteenth and nineteenth century keep it simpler: the salsify is to be cooked in water with some butter (see this recipe). And in 1651 La Varenne just says they have to be cooked and prepared like parsnips. Escoffier prefers using rendered suet, tallow from beef, or a combination of beef and calf suet, for deepfrying. But he also used lard, combined with other kinds of fat. If you start at the beginning, by rendering suet, the fat has to be grated or chopped finely, and added to a pan with 3/4 litre water for 5 kilogram suet (1.5 decilitre water for 1 kilo suet). Heat until the water has evaporated and the pieces of fat are reduced to cracklings (about twenty to thirty minutes). Let it cool for a short while, then strain it. This is tallow (here you have an illustrated guide to rendering tallow). The fritters must be fried dans la friture très chaude, in very hot frying fat, which means according to Escoffier at 180 °C/355 °F. In Belgium and the Netherlands you can buy tallow especially for deep-frying, called ossewit of blanc de boeuf. I think in England it is called shortening, but that can also be made of vegetable fat, so look at the ingredients before you buy. But Escoffier himself also mentions vegetable oils, goose fat and even butter as possible mediums for deep frying. For 4 persons; preparation in advance 1 hour; preparation 15 minutes. If you use suet, you’ll have to render it first (see above). Tallow or shortening just has to be heated. Mix all ingredients for the batter, place in refridgerator for an hour. 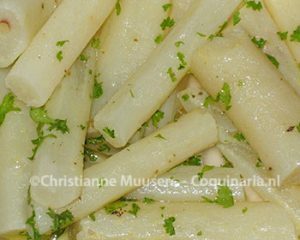 Sprinkle the precooked salsify with lemon juice, oil and parsley, marinate for thirty minutes. Then drain well, and pat dry with kitchen towels. Heat the frying fat to 180 °C/355 °F. Cover the pieces of salsify in flour if you want, to make sure the batter doesn’t slide off too easily. Fry the pieces three or four at the same time in the deep fryer, fry until the crust is brown and crisp. Drain, and keep warm in the oven at 120 °C/250 °F with the door slightly ajar to keep the fritters crispy. If all the vegetables are fried, dip a few tufts of parsley for a few seconds in the hot fat. The parsley will remain bright green and wonderfully crisp. Just as Japanese like to serve tempura on rice paper to absorb fat, in Europe deep fried dishes used to be served on linen napkins, like croquettes. So, if you want to serve in style, cover each individual plate with a folded napkin, and place on each napkin some salsify or scorzonera fritters, decorated with deep-fried parsley. To me, this dish is an hors d’oeuvre, but it could be a side dish in the rich classical French cuisine. Cooking in a blanc is used not only for vegetables, but also meat that must be as white as possible, like chicken breast. Chop or grate the suet. Place a bowl with water nearby to put the salsify or scorzonera in as soon as it is peeled, to prevent discolouring. According to Escofier, the salsify or scorzonera has to boiled before cutting it in pieces, but if you do that first, you’ll need a smaller pan and less water. Bring water, flour, salt and vinegar or lemon juice to the boil. Add the onion with the clove, bouquet garni and root vegetables, and the finely chopped suet. Let cook for ten to fifteen minutes, and drain well. Take care NOT to pour the cooking liquid in the sink, because the suet will congeal when it has cooled, and clog the drain. A bundle of aromatic herbs, that is added to stock or stew. They are removed before serving the dish. The usual combination is parsley, thyme and bayleaf, but other herbs can also be used, like rosemary, sage or chervil. 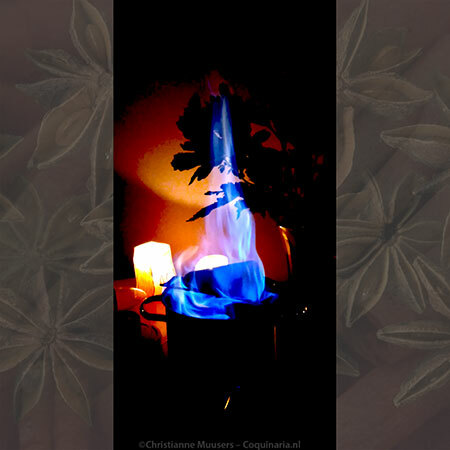 The term bouquet (without the garni) is already used by François La Varenne in 1651 in his stock recipe (Le Cuisinier François, II), but except for cloves he doesn’t specify the herbs. However, in the second edition he mentions parsley, chives and thyme. Pierre de Lune (Le cuisinier) also uses the bouquet in 1656, but he calls it a paquet, consisting of thyme, chervil, parsley and clove, and a piece of lard when the dish was to be served on a meat day. This is rendered suet. You can buy it at supermarkets as beef shortening (the picture shows the Belgian/Dutch commercial tallow for deepfrying), but you can also make it yourself (see here). Because fat congeals when it cools, you must filter it after each use when it is still liquid. Keep the fat in a cool place. By the way, if you prefer vegetable oil for deepfrying: that also has to be filtered before storing away. It may be clear that tallow is not to be used for vegetarians. If you use different kinds of fat for deepfrying (as I do), store them all with labels on which you note how often and when it was used. Fat that congeals at lower temperatures (animal and vegetable) is less and less used in the Netherlands, probably because of the extra work it entails. And tallow, being an animal fat, is of course regarded as highly suspicious, because of the scare forbad fat. However … if you only use tallow occiasionally, nothing is wrong with it. If you mix tallow with birdseed, it is ideal winterfood for birds. Auguste Escoffier, Le guide culinaire. First edition was in 1902, last edition authorized by Escoffier was the fourth, from 1921. Most all recent editions and translations are from this fourth edition (English: The Escoffier Cookbook and Guide to the Fine Art of Cookery ). The first English translation dates from 1907, which was made from the first French edition (A Guide to Modern Cookery , William Heinemann, London, 1907).